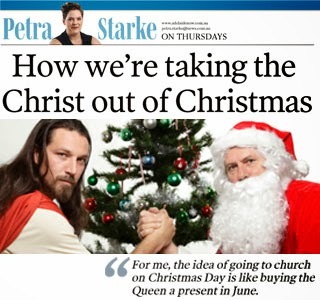 MORE than 60 per cent of Australians identified themselves as Christian in the last census – yet I reckon it’d be easier to find someone reading a Boxing Day sales catalogue than the scripture on Christmas Day. That’s not a bad thing, it’s just an odd thing. While one fraction of the country treats Christmas with religious reverence, the other just gets tipsy and eats too much pudding. Who’s right? And should we even care? THIS Christmas I was going to buy the Australian economy a new iPad, because we keep being told it’s depressed and I wanted to cheer it up a bit. But then I read the paper on Monday and learned I was already giving it $993, so I decided not to. You are, too, by the way. According to a Commonwealth Bank survey every Australian adult is going to spend an average of $993 this Christmas – on presents, holidays, food, drink and most probably those crackers with the terrible jokes and bits of plastic generously described as ‘‘toys’’ in them. That’s more than the British, who the Daily Mail reports are only spending about £445, or $681, and it’s way more than our American friends – who have only budgeted $US704, or $673. All up, the CBA says, our nation will spend $16.2 billion celebrating this one day of the year. That’s a bit more than it cost to stage the London Olympics – and they had the Spice Girls. And get this, almost half our spending – $475 per person – is going on presents. That sounds sensible, doesn’t it? I mean, for a holiday that celebrates the birth of a man who championed the poor and disadvantaged and said things like: ‘‘A man’s life does not consist in the abundance of his possessions’’. Yes, I’m talking about Jesus. Sorry to ruin all your consumerist fun, but that is actually what this whole shindig is about. Well, technically, anyway. For many Australians the only thing they’re religious about at Christmas is keeping the roast moist and Uncle Reg away from the eggnog. I include myself among them. For me, the idea of going to church on Christmas Day is like buying the Queen a birthday present in June. I have no relationship with Jesus whatsoever, save for those occasions when I drop something large and heavy on my foot, and then I’m on first-name terms with him. Despite this, and despite the fact that I won’t do anything even slightly pious this Christmas, I do find it rather fascinating that such a deeply religious holiday is, for many, now more synonymous with the emptying of wallets than it is with anything from the Bible. reverence, the other just gets tipsy and eats too much pudding. Who’s right? And should we even care? Last week Americans enjoyed Thanksgiving, a holiday that has almost totally shed its 17th century religious roots to become a general celebration of family, friends and food. The flood of roast turkey and pumpkin pie-related noises coming from across the pond prompted a friend of mine to bemoan the lack of a similar holiday in Australia. ‘‘I wish we had a holiday that gave everyone the excuse to eat turkey and hang out with family,’’ she sighed. ‘‘I mean a secular holiday,’’ she said. Well if, as I suspect is the case for a large proportion of Aussies, the main point of Christmas is getting together with loved ones to eat too much and swap presents, then I’d argue that’s exactly what it is. In the meantime, I know what I’d like for Christmas – about $993 sounds good. First published in The Advertiser, November 29, 2011.